A rich, turmeric-dyed robe looks elegant while you lounge at home—but you can wear it around town, too. 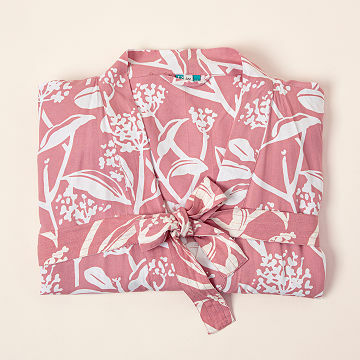 When we held this kimono for the first time we said, "Oh, that's the one." It's soft like a kitten, but sturdy—like machine washable, tumble dry-able sturdy. To create it, artisans take strips of rayon, cover them in a wax design, then submerge it in a hot seaweed bath to give it that golden color. When it dries, they peel off the wax to reveal a twisting floral design that looks elegant while you're lounging at home. Or slide it on over jeans and a tank, and wear it out to lunch with friends. It's a radiant gift that will have your loved one over the moon—or maybe in this case, the sun. Handmade in Bali. Machine wash and dry gentle & low heat. This beautiful garment can be used for many years to come and will be a delightful addition to any woman's wardrobe. Perfect gift for my sissy. She uses it as a robe, I'd wear it with jeans and white t-shirt. This robe is such a pleasure to wear....a nice long length, fabric that is just heavy enough but still a summer weight, and also has pockets in the side seams and also belt loops. I love wearing this, makes me feel so elegant!